2016 was the most successful for Katie and Llew where they continue to compete at first ridden, however they moved up to intermediate and open levels and have enjoyed considerable success throughout the year. They qualified for the 1st ridden, intermediate, open and junior ridden finals at NPS Summer championship show in Malvern and the open and 1st ridden finals at NPS Scotland championships at Blair. At the NPS finals, in Malvern, Katie and Llew competed in the Scottish team and were placed in all classes with the Scottish team coming a commendable 4th. They also came second in the intermediate A&Bs and 10th in the junior ridden final. At Blair, the combination came 2nd in the 1st ridden final after missing the open A&B final due to Mum getting all the timings wrong!! 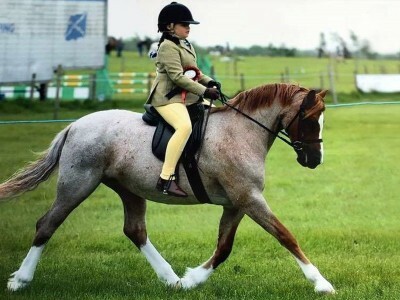 In the past llew has been mini champion at the royal welsh and reserve champion in the kingsford award at Ponies UK. Katie is very much looking forward to year ahead with their first finals of 2017 being at the spring festival at Onley where they shall be competing once again in the junior ridden final.